Ginsan-Ko steel is forged by our master artisans to create traditional Japanese knives of the highest quality that can provide peace of mind in high paced work environment. It uses traditional methods of craftsmanship blended with modern metallurgy. It is a breakthrough in the incorporation of high carbon steel and stain resistant metallic elements. With a hardness on the Rockwell scale of 61, it offers exceptional sharpness and edge retention with stainless steel properties for a peace of mind in a high-paced work environment. The traditional Japanese boning knife for poultry known as Sabaki or Honesuki knife is becoming one of the most sought after new tools for cooks and chefs. Our Yoshihiro Ginsan-Ko Honesuki boning knife not only filet and fabricates raw meat for cooking, but can be used to carve apart roast chicken and other poultry such as turkey straight from the oven for meals and attractive presentation during holidays and special occasions. It is forged with particular care to create a blade with a hefty spine and sturdy heel that arcs into an elegant tip, which can maneuver through both delicate filet and heavy joints with finesse. The Ginsan-Ko Honesuki Boning Knife is complimented with a High Carbon Stain Resistant bolster with a handcrafted Pakkawood handle for a durable yet comfortable grip. Hand wash with mild cleanser; NSF Approved; Handmade by skilled tradesmen in Japan. 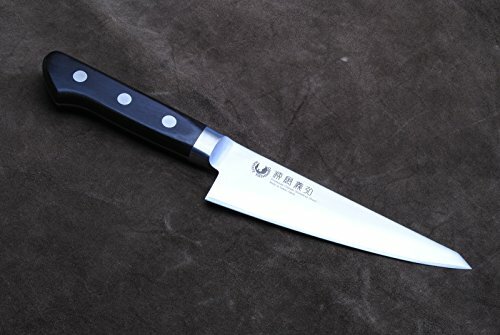 Honesuki is a boning knife specifically designed for parting out poultry and meat from bone resulting in a beautiful filet. Forged from a single piece of Ginsan-Ko Japanese High Carbon Stain Resistant Steel (HRC 61). High Carbon Stain Resistant bolster with a handcrafted pakkawood handle for a durable yet comfortable grip. Exceptional sharpness and edge retention like a high carbon knife, yet stain-resistant for a peace of mind in a high-paced work environment. Hand wash with mild cleanser; NSF Approved; Handmade by skilled tradesmen in Japan.